I’m working in a workshop in Arita, in Kyushu. I’m trying to learn something about working with single stone porcelain. The potters of Arita in Japan have been making porcelain ‘jiki’ pots out of this single crushed stone from the izumiyama mountain quarry for four hundred years and they have developed a technique or two in that time. I’m keen to learn just a fraction of that knowledge in the very brief 5 weeks that I have here. Arita is famous for being the first place in Japan where porcelain stone was discovered and white porcelain was subsequently made here. This place has a very long history. The first porcelain being made here in 1616. Since then the industry has had it’s highs and lows. We are currently in a low. Just like everywhere else in the world, the industry here is facing steep competition from China. Only a couple of decades ago, there were 300 studios here in this little town. Now there are only 100 and falling steadily. No country or industry can compete with the low cost-base of China. The best hope that they have is to engage with people like me, cultural tourists. I’m prepared to pay for the experience of working here in this amazing place, with this unique material that they have here. 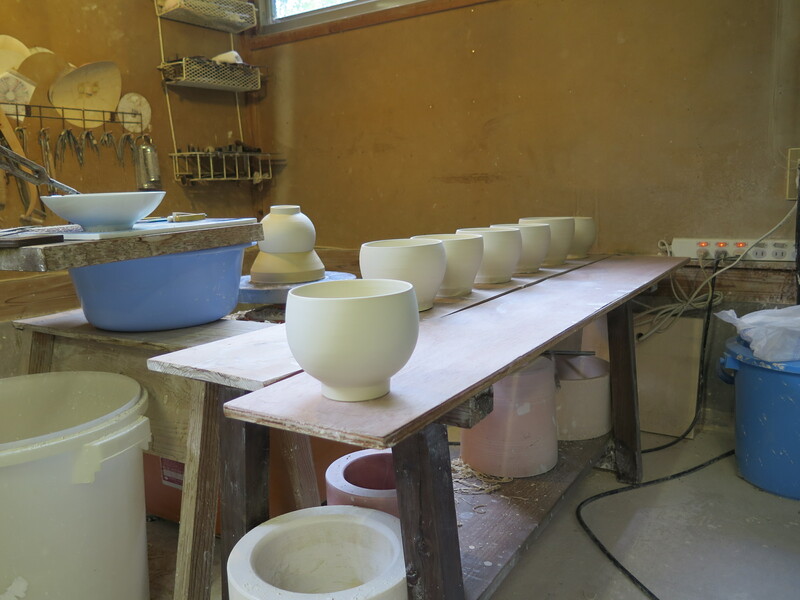 Merging traditional porcelain manufacture with paid workshop access for artists could be the difference between financial survival in the future. This town needs more accommodation and restaurants, if it is to encourage more longer-stay cultural tourism. Something more than the usual casual day-visit for shopping. I don’t think that they really understand how rare and amazing this stuff really is on a global scale. So don’t fully understand its true value and what they have to offer. It’s just so normal for them here, after so many centuries. They don’t realise the special nature of what they have. It’s bred by familiarity! As all the workshops seem to be struggling financially, People like me could be the cash cows of the future, or at least part of the fiscal solution. In the early 1600’s, the great Japanese Warlord Hideoshi invaded Korean. He captured potters and repatriated them to Japan. Rendition! It sounds familiar? A potter, named Ri Sampei, he was actually a part time potter and part time vegetable grower (farmer). Sounds familiar. He was captured and brought to this place. 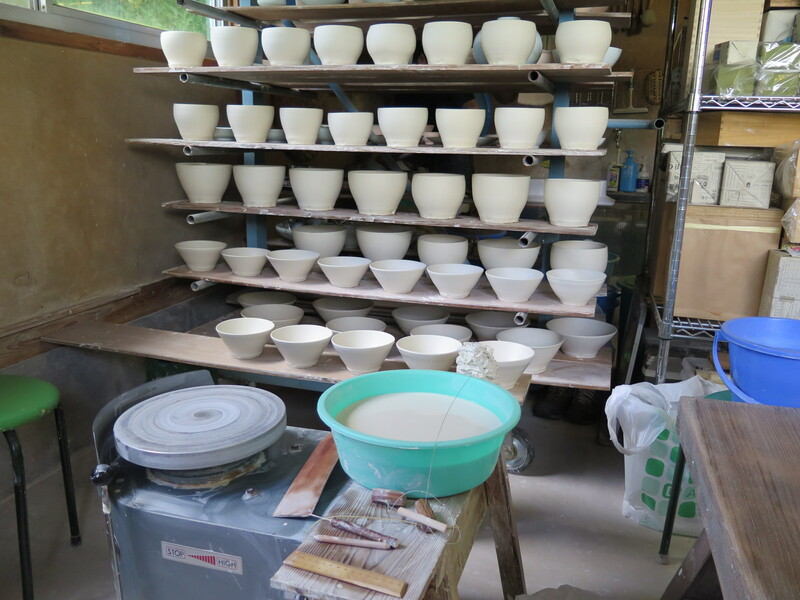 He soon discovered the special porcelain stone in the mountain of Izumiyama just outside of the village of Arita. 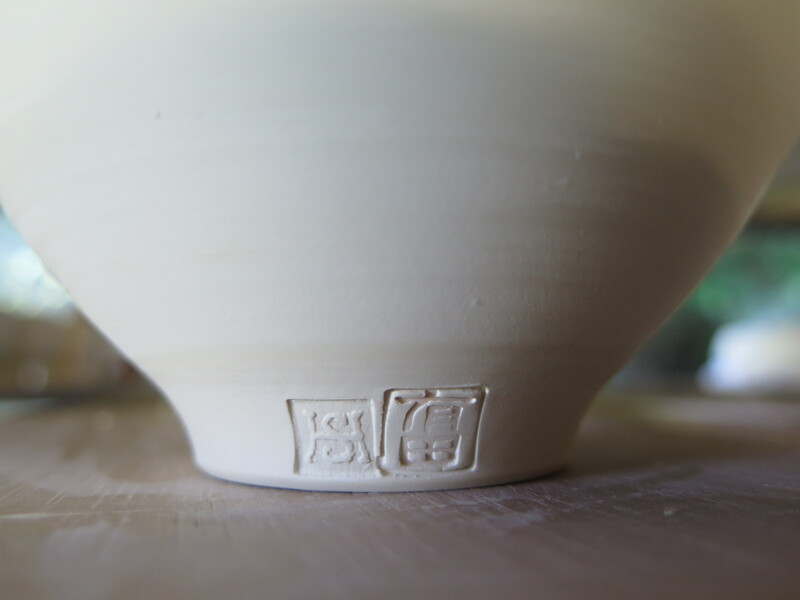 He recognised it for what it was and began to make the first white porcelain in Japan, called Shira Jiki. The rest is history. 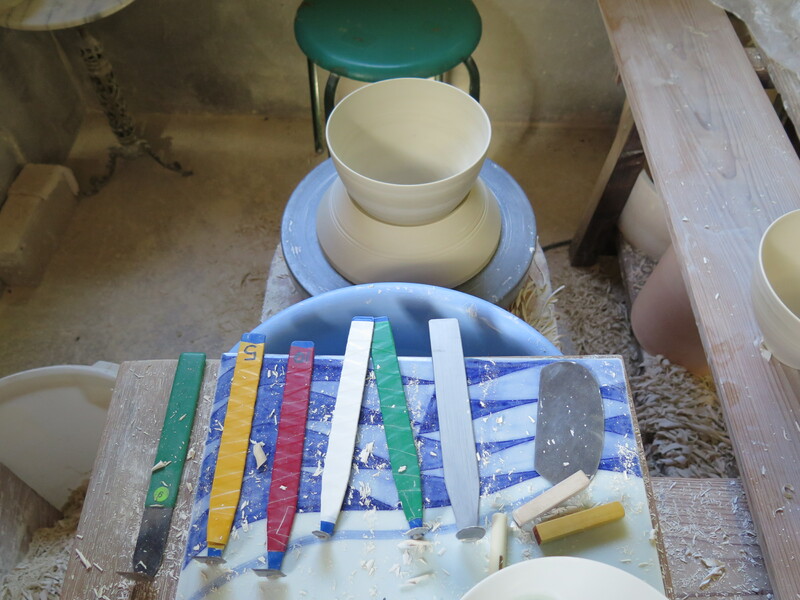 First day, I start with a clean wheel and pot boards, + a few lumps of porcelain clay. So I’ve come to this place to experience the special southern Japanese porcelain techniques that have been developed here. This stuff is amazing, sufficiently plastic to throw well enough, so that you don’t really think that you are throwing with a ground up piece of stone. It is quite strong and stands up well on the wheel. Not vigorous, but sufficiently robust to make reasonable forms easily. For me anyway. It is miles away from what I’m used to. The hard rock that I grind up at Home is a solid, non-plastic affair. I know from my reading that this stone here, is highly weathered. In a form known to geologists as ‘hydrothermal weathering’, where hot steam has passed through fissures in the parent rock, reducing what was formerly hard granite, to a soft crumbly type of soft white mica called Sericite. Sericite is both slightly plastic, throwable and highly fluxed at the same time. Plus, it is very low in iron oxide. A very unusual combination of characteristics. Only a few places in the world have materials like this at hand. 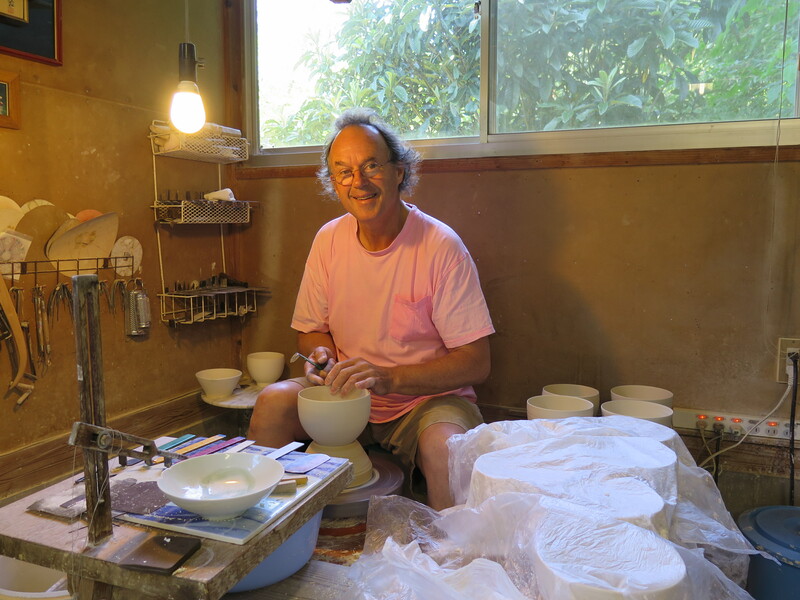 I find that the clay is used so soft here in this workshop, that I can’t separate my pots from the wheel-head using a conventional cutting string and lifting technique that I’m used to. I find that I have to use so much force to allow air in under the pot to lift it, that it distorts the bowl. 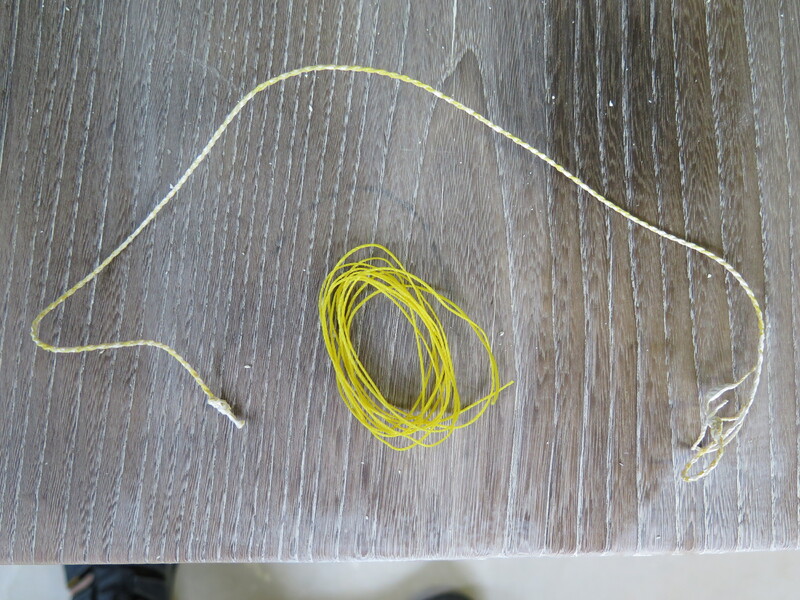 I take a moment to make myself an extra thick, double twisted, multi-stranded, cutting string. 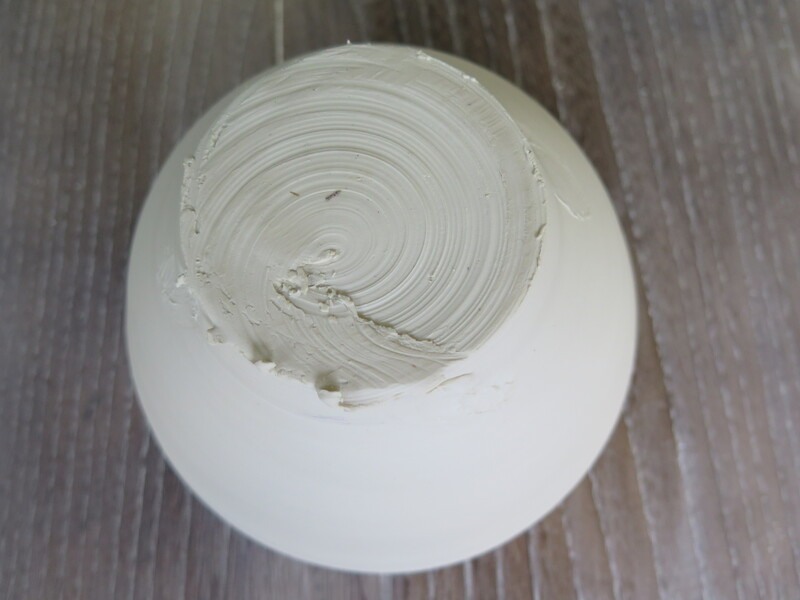 The texture that it creates as it passes through the ultra-fine porcelain clay allows air to penetrate, so breaking the vacuum seal and allowing the pot to be easily removed from the wheel head. I settle in for a few of weeks of intensive work. We work together, side by side. I’m, in the workshop of Tsutsui Tatsuya. He is very experienced, having spent 40 years in this workshop. Purpose built, up on the hill overlooking Arita’s U-Tan district. 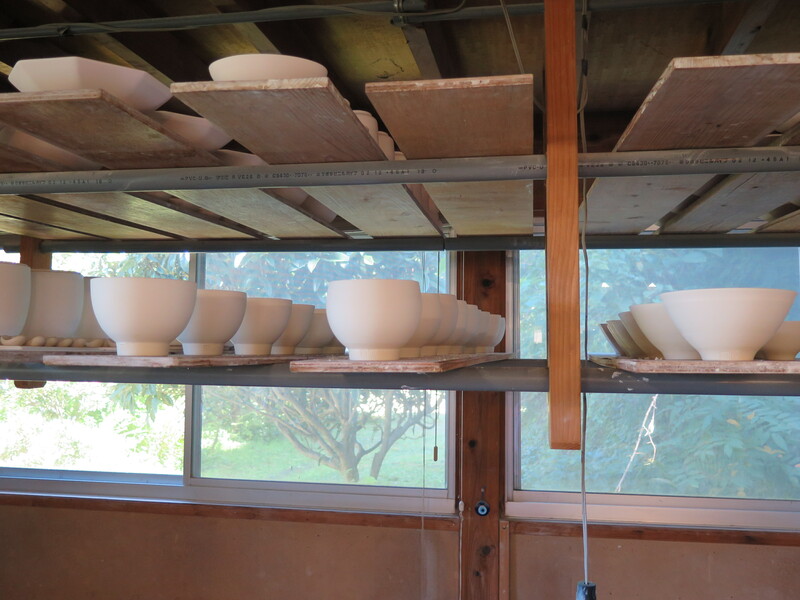 I spend half a day throwing my pots and then spend a week turning them, and so it goes for the rest of my time here. I soon fill my shelves and then I’m looking for more storage space in the overhead racks, above the wheels. The turning here is a different story to what I’m used to. It takes me back to my student days working for the Japanese Potter Shiga Shigeo. 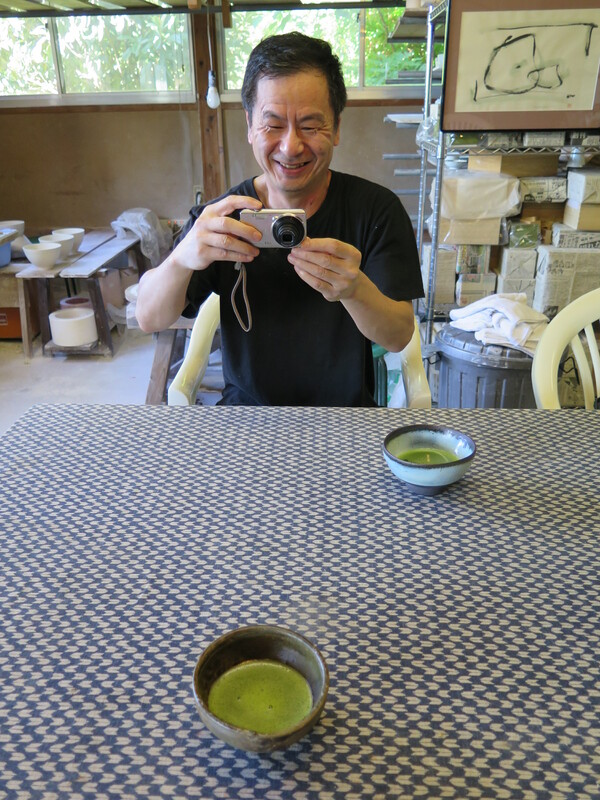 He was trained in the porcelain techniques of Kyoto and worked for the ‘Nation Treasure’ potter Tomimoto in Kyoto, another porcelain centre of excellence in Japan. Here they turn not just outside, but inside as well. I’m not used to that. I have tried in the past to get my form just about right on the wheel, so that there would be as little turning as possible. Here they all seem to use the ‘nobebere’ profile stick to throw the forms. Another thing that I’m not used to. But I’m here to learn and to experiment. This work requires you to be both meticulous in detail and therefore precise in your hand-eye co-ordination, I’m not too sure if I’m up to it, but I give it my best, roughing out on the next day and turning down to form on the third, then the precise thinning and finishing when it is bone dry on the next, or any time after really. It doesn’t matter once it is fully dried out. I get to use my new tungsten-carbide-tipped turning tools for the job. I’ve colour-coded them. I need to get out more! First pot finished, 89 to go. 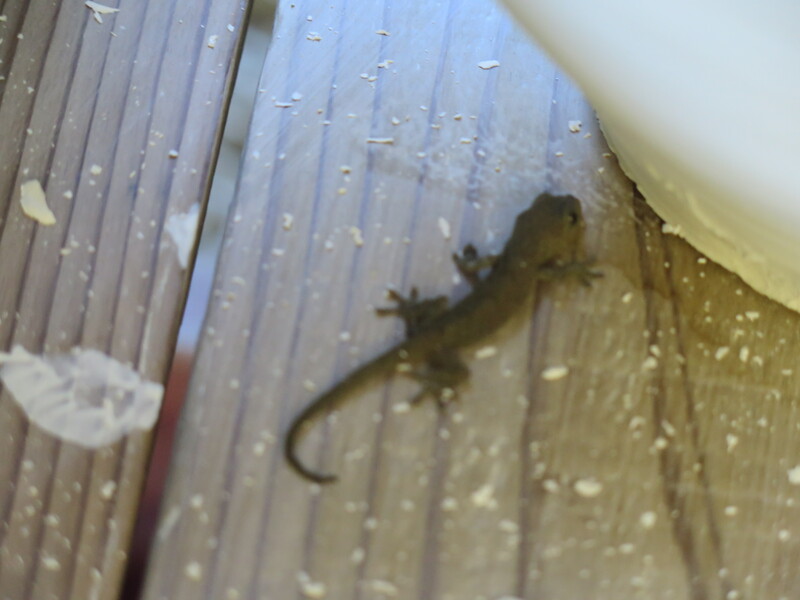 A gecko comes to visit me while I’m turning. 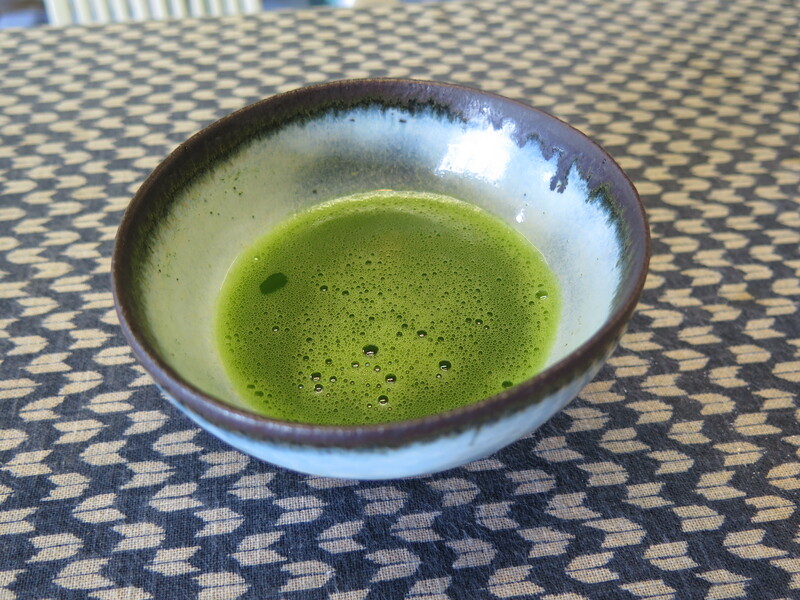 Today Tatsuya made us a cup of matcha for afternoon tea break. It was amazing. 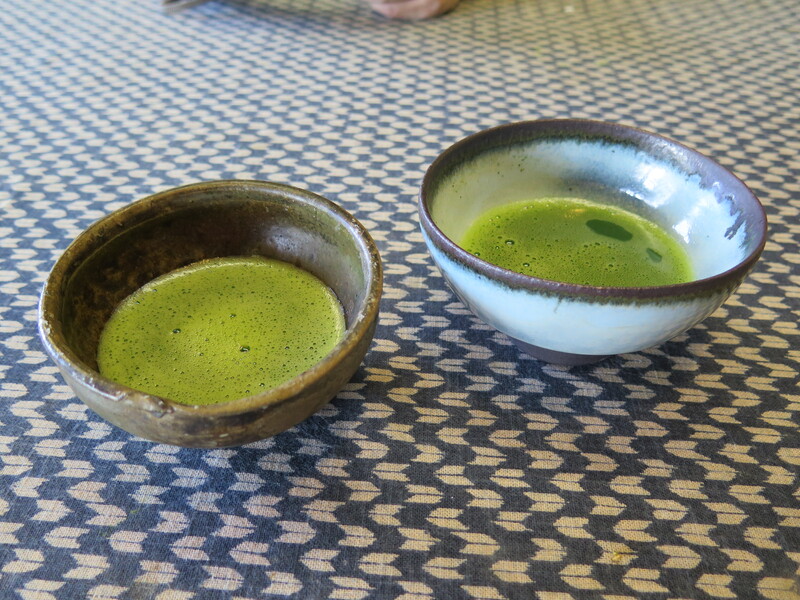 He offered me his father’s Karatsu tea bowl and chose to use the bowl that I had recently given him as a gift, for himself. The tea looked really good in them. We both reached for our cameras at the same time. We laughed! So funny!. We were both thinking that we ought to record the special image of this very particular event on our cameras. It’s a modern world, in this ancient place. So full of history, you can taste it! The perfect juxtaposition of then and now. 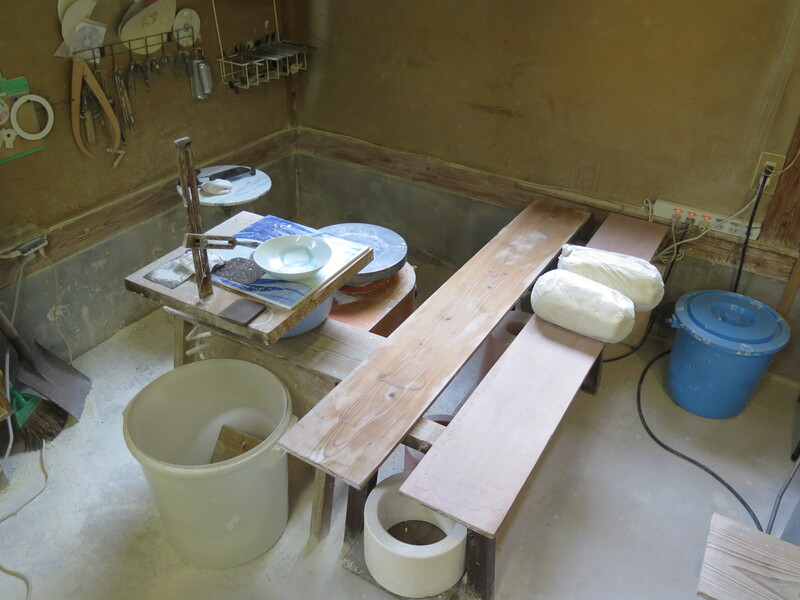 This entry was posted in arita, In the pottery, Japan, travel and tagged Arita, Japan, travel by hotnsticky. Bookmark the permalink.